Isaac is a PhD student at University of Washington specializing in modern Japan. For more from Isaac, check out his podcast here. 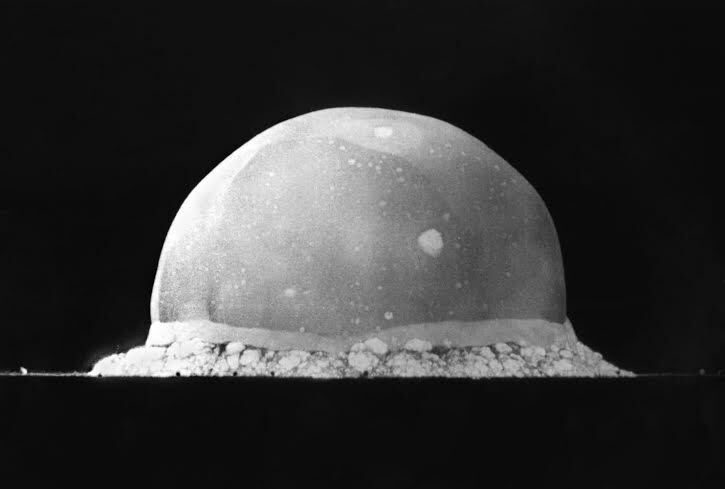 The Manhattan Project, like so much of the Second World War, has its roots in the First. The “war to end all wars” which raged across Europe and around the world from 1914-1918 was the first time any world power seriously considered using aerially-delivered explosives to bomb an enemy into submission. The Germans were the first to make the attempt; hemmed in by Allied blockades and facing a deteriorating military situation where they’d expected rapid victory, the German government deployed its fleet of dirigible airships (zeppelins, in other words) to attack the United Kingdom in 1915. The Allies would eventually respond with bombing raids of their own. In every case, military leaders expected great results from aerial bombing – the thinking was that, helpless before the destruction raining from the air, enemy leaders would simply surrender. If they did not, they faced the destruction of their nation’s industrial capacity via bombing, and ran the risk that their own populations would rise up and demand an end to the war. However, this goal proved elusive, mostly because of the underdeveloped nature of the era’s weapons technology. German zeppelin raids, for example, killed a total of 556 people across the entire war, compared to around 7000 British dead in the First Battle of Ypres alone. After the war ended, however, enthusiasm for the idea of winning a war from the air did not dim. And really, who could blame the leaders of the age? The past war had proven how bloody even indecisive victories on the ground could be, and seapower came with its own host of issues – victory via blockade takes a great deal of time in addition to the at best dubious ethics involved in cutting off all the enemy’s trade (including food, medicine, and other essentials). If a war could be won rapidly from the air, could that not potentially be more humane? Military theorists from the Italian Giulio Douhet to the British Sir Hugh Trenchard and the American Billy Mitchell advanced just that argument, and in doing so joined a military tradition stretching back as far as Sherman’s march to the sea and Napoleon’s brutal campaigns – aiming to make war horrible in order to make it short. At the same time, the new field of atomic science promised tremendous advances in military power (as well as other areas). From the time of Marie Curie, it was understood that radiation was the slow, natural emission of energy from an object; the process released little energy at a given moment, but a great deal of energy over the course of its lifetime. This understanding opened the way to a new idea; what if you could get a radioactive object to emit all of its energy extremely quickly, rather than slowly over the course of many years? In theory, you could have the quantity of energy needed to power a city – or, if you really sped the process up, enough energy to make a bomb. The first person to suggest the idea of so-called “atomic weapons” was British novelist H.G. Wells; in his 1914 work The World Set Free, Wells described powerful “atomic bombs” that would be part of a horribly apocalyptic conflict so devastating that it convinced mankind of the folly of warfare, ushering in an age of perpetual peace. In the 1920s and 1930s the notion of atomic bombs continued to receive play in academic and popular circles, but it wasn’t until 1934 that the idea became a real possibility. In that year, a Hungarian-born German Jew named Leo Szilard filed a patent in London describing the idea of firing neutrons at a radioactive atom to set off a chain reaction. This idea would form the basis for all subsequent work on nuclear fission – the splitting of radioactive atoms to produce energy – including the atomic bomb. Szilard himself later emigrated to the United States, where he would play a key role in the Manhattan Project. When the Second World War broke out in September, 1939, all the major belligerent powers had atomic weapons projects. In the Japanese case, the lead scientist, Dr. Nishina Yoshio, eventually convinced the government that the project was not feasible; he said that current resources and technology were not adequate for the development of atomic weapons. In an ironic twist of fate, Nishina would be dispatched to Hiroshima on August 7, 1945 and would eventually be the one to inform the Japanese government that the Americans had proven him wrong. Nazi Germany began its program in the 1930s, but was hampered by a lack of resources as well as the project’s own staff. The chief scientist on the German project, Werner Heisenberg, was more interested in partying on the government dime and building a nuclear power infrastructure than trying to build a weapon – though Heisenberg himself attributed the failure of the project to a deliberate decision on his part to try to prevent Hitler from obtaining a bomb. Whatever the reason, Heisenberg’s failure saved his life; in 1944, the United States dispatched former Boston Red Sox catcher and wartime Office of Strategic Services (OSS) operative Moe Berg to neutral Switzerland to hear a talk given by Heisenberg. If the talk gave Berg the impression that Germany was close to the completion of its own nuclear weapon, then Berg was under orders to assassinate Heisenberg. It did not, and as a result Heisenberg walked away unscathed. In the United States, what became the Manhattan Project got its start in August, 1939, with a letter co-authored by Leo Szilard and Albert Einstein to sitting President Franklin Roosevelt. The letter warned of the potential of atomic weapons and noted that Germany was pursuing the weapons as well. 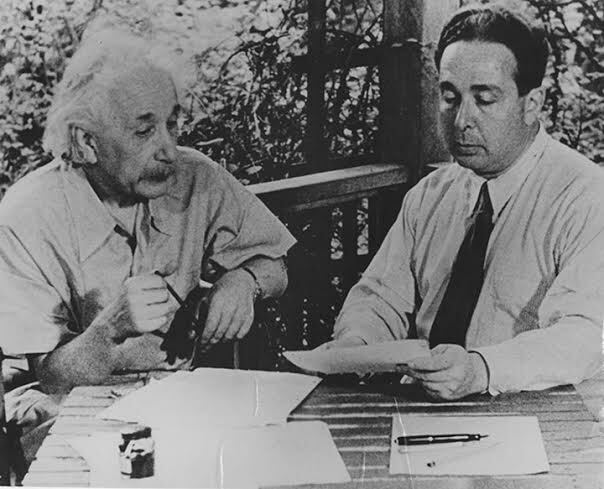 Einstein and Szilard did not recommend an American attempt to “race” the Germans to a completed bomb; instead, they merely suggested closer coordination between American physics laboratories and the government to ascertain the potential danger of such a weapon. However, President Roosevelt decided to take the idea further and ordered the development of atomic weaponry for the United States (eventually, the US program was merged with other Allied programs in Canada and the United Kingdom). 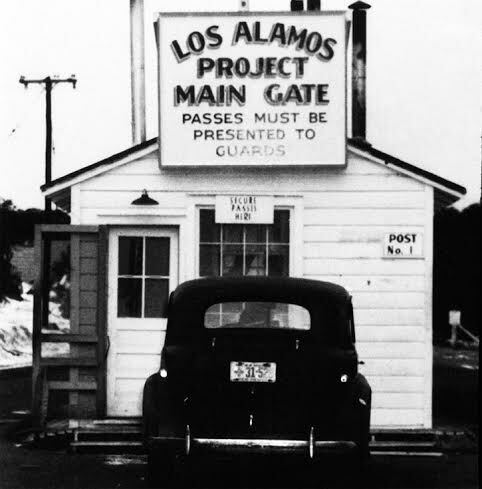 Eventually 19 sites across the US and Canada were linked to the project (the three most important being the Oak Ridge Facility in Tennessee, the central laboratory at Los Alamos, and the Hanford site). The history of the Manhattan Project in total is far too great in scope to recount here; suffice it to say that by 1945 its success was assured. 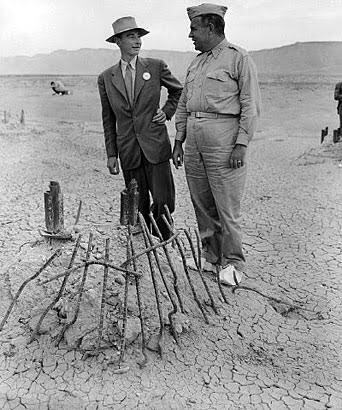 However, the more complex plutonium weapons constructed using material enriched at Hanford had the potential to fail in actual field use, so project director J. Robert Oppenheimer wanted a field test to ensure the design would work. At 5:30 AM on July 16, 1945, Oppenheimer, along with other scientific and military observers, saw the first nuclear explosion in history when a plutonium bomb was detonated in Alamogordo, New Mexico. The “Trinity” Test, so known because the operational code name used for the test was Operation Trinity, was a complete success. ← Art is not what you see, but what you make others see.